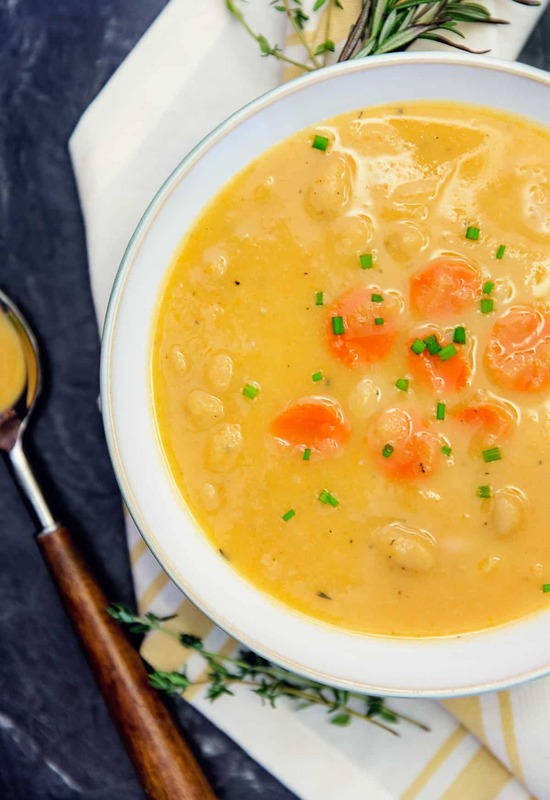 This delicious Creamy Cauliflower Bean Soup is the perfect soup on a cold winter day. 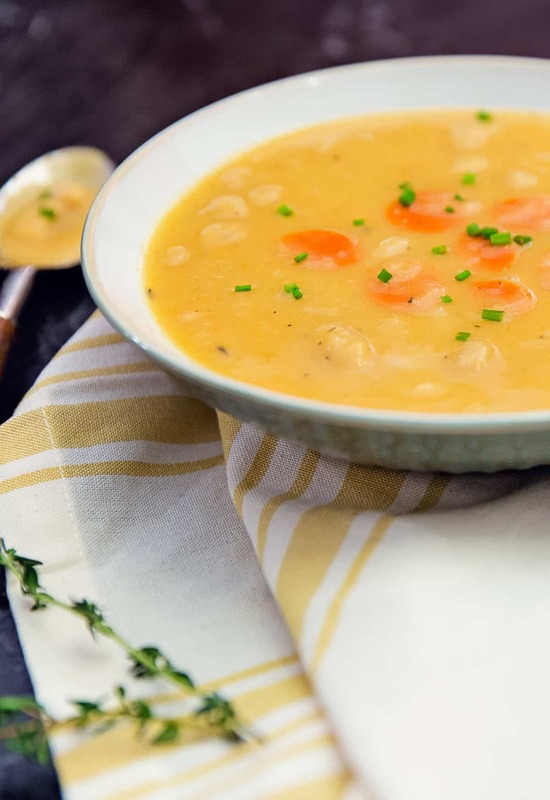 Its creamy texture coupled with a healthy amount of white beans makes it hearty and oh so yummy! 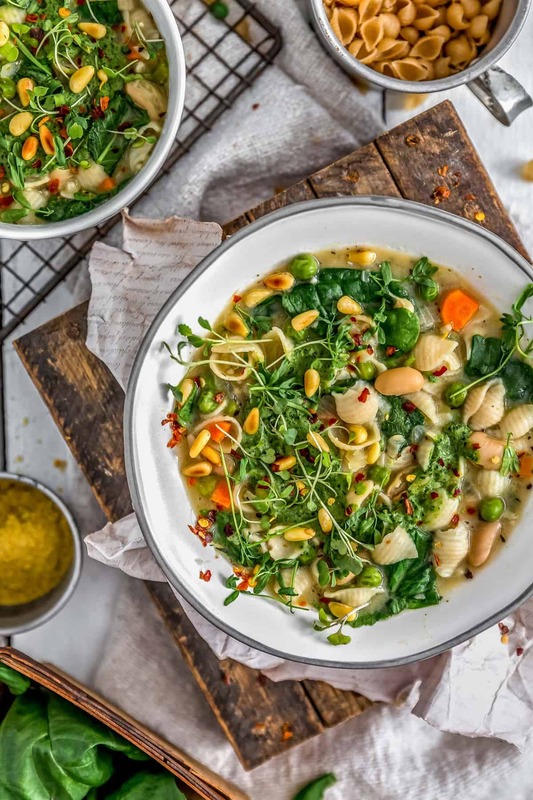 Enjoy this healthy and wholesome Whole Food Plant Based soup; it is sure to be a new cold day favorite! 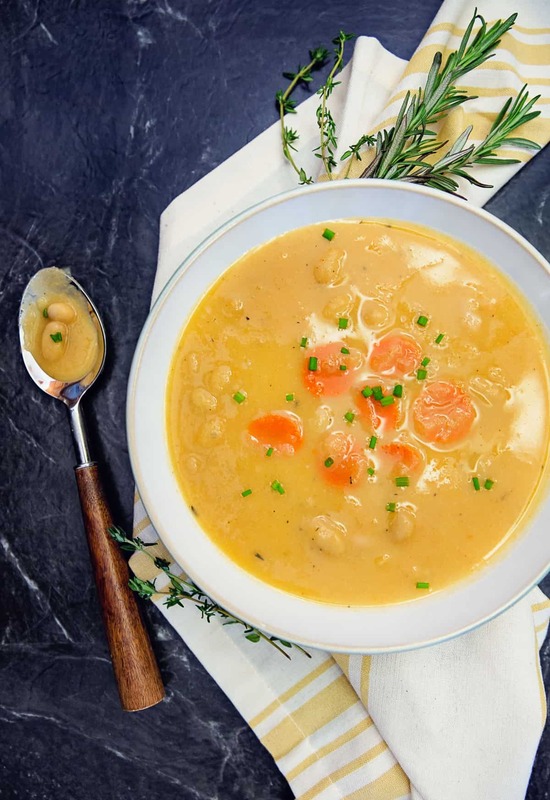 Our Creamy Cauliflower White Bean Soup harnesses the natural creaminess of cauliflower. What? There is no cashew cream? No need for cashew cream for this soup recipe. Don’t get me wrong, I love me some cashew cream 😉 But it is always nice to step out, switch it up, and use a vegetable to create a yummy, creamy soup. Blending cauliflower makes a rich and silky texture, and the seasoning perfectly complements the cauliflower and white beans. Monkey and I love to make soup. There is something very homey and comforting associated with making soups from scratch, especially when the weather is frigidly cold and snow is falling. The minute I hear the snowplows going up and down the roads, I feel a strong urge to get out my soup stock pots and start chopping vegetables for soup. Perhaps it just reminds me of my childhood when falling snow and soup were a big deal. Who remembers the blizzards of 1976 and 1977? In Northeast Ohio, we had two historic blizzards back-to-back starting in December 1976 continuing through January 1977. I will never forget them. I remember waking up and seeing nothing but white out of all our windows. We lived in farm country so there were no natural wind breaks. So often times snowdrifts could reach up to 9 feet high. Our front door was snowed shut several times by huge snowdrifts. One time my dad could not open the front door to get outside as the snow was too high and had buried it shut. He eventually had to open a window only to find a solid block of snow. He had to tunnel though it and crawl outside. As kids, we totally thought that we were buried alive and would never see the light of day again – LOL. The incredible silence created by a wall of snow was eerie, and yet somehow peaceful. Our home was primarily heated by an old pot belly wood-burning stove, so my dad was concerned that the snow might cover the smoke stack so getting outside to see what was going on was priority number one. I have fond memories of my mom placing dish-towel covered bowls of buckwheat bread dough near the pot belly stove to rise. The smell of rising yeasty bread would fill the entire house. Eventually, my dad shoveled a path to our front door so we could get outside. I remember walking outside absolutely overwhelmed with the abundance of snow. It was brutally cold and the snow had drifted up over top of our roof and had engulfed most of our home. The tool shed was completely buried. If you didn’t know it was there, you would just think it was a huge snowdrift. My dad spent hours trying to dig out a path to the warehouse so he could get the front-end loader out. Later that day, he hooked up a skid and all the neighboring farm kids hopped on while he plowed a way to our small town to get groceries. Soup was waiting for us! By the time, we got back from town, we were frozen and shivering. My mom had a huge bowl of hot soup with homemade buckwheat rolls ready for us. I honestly don’t remember what type of soup it was, probably vegetable beef since that was her specialty. But I will always remember her buckwheat rolls, slathered in butter, of course – LOL. My dad always got freshly stone-ground buckwheat flour from an Amish farmer so maybe that is why her rolls were extra delicious, or maybe it was the generous layer of creamy butter? HAH! Anyone like to share their 1976-1977 blizzard experiences with us? We would love to hear your stories. 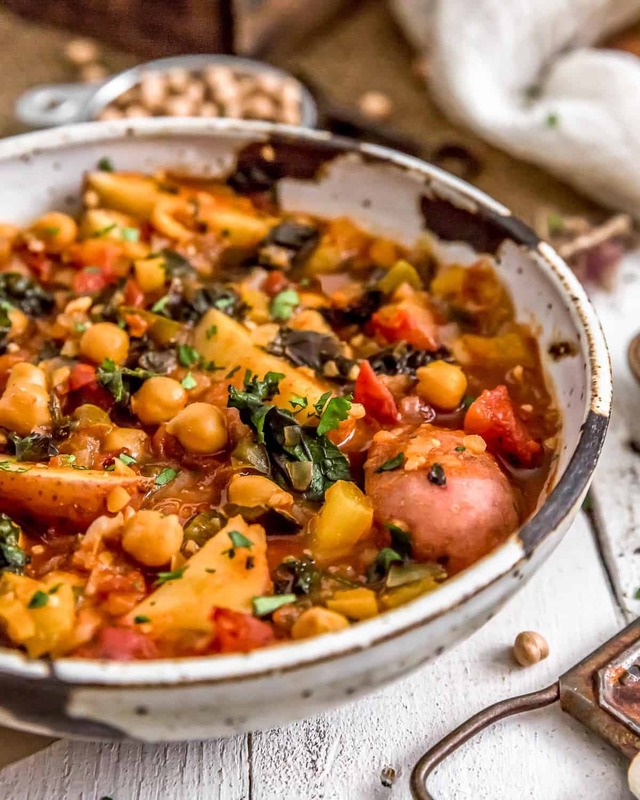 What is better than a warm, delicious bowl of healthy soup? 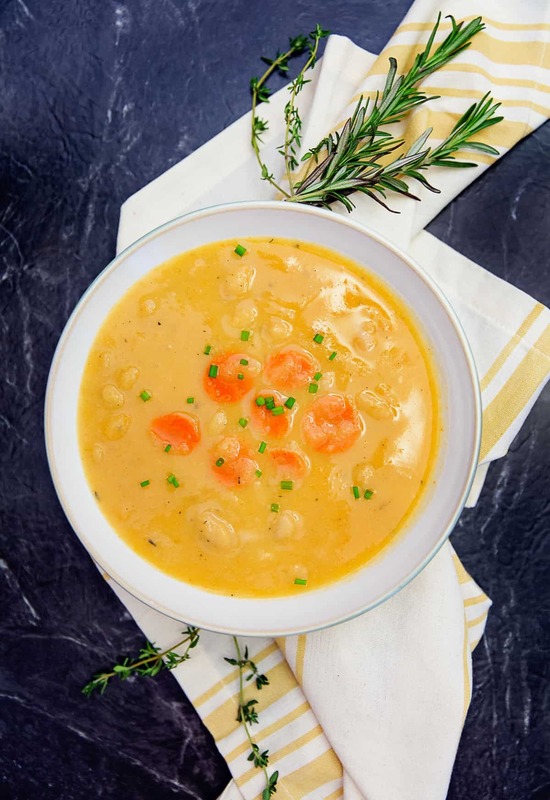 This yummy Creamy Cauliflower Bean Soup is hearty and nutritious; and is especially delightful on chilly days or nights. As you have probably figured out by now, we are a soup family :). We always have tons of soup in the fridge. My mom has cases and cases of half-gallon glass mason jars, you know, the really big ones. We put our soups in the mason jars while the soup is still piping hot, put on a lid, and tighten down the ring and let the soup cool to room temperature. The soup will vacuum seal itself, giving you a few extra days of freshness in the fridge. I love those mason jars. They are by far the easiest way to store soup in the fridge. 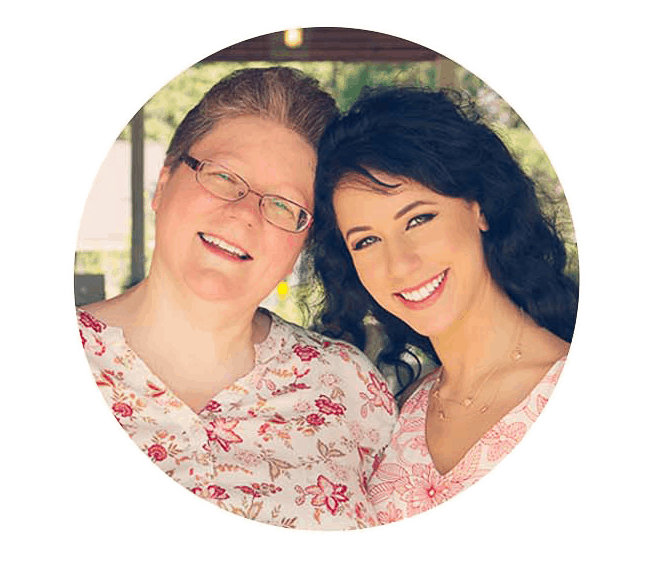 Initially, we were buying the half gallon mason jars directly from the manufacturer, but the shipping was costs were pretty high; then almost by magic, our local large chain store started carrying them. *WOOT*. We stocked up as we also store our dry beans and rice in them. 4 – 15.5 oz. cans white beans (cannellini, great northern, navy, etc.) or 3 cups dried white beans - cooked. In a large ceramic/enamel lined Dutch oven, add the diced onions, diced carrots, and diced celery, and sauté until translucent, about 5 to 7 minutes or until the veggies are tender. (If needed to prevent sticking, add 1- 2 Tablespoons of vegetable broth or water). Add the cut-up cauliflower, water, vegetable broth, bay leaf, and sea salt to the pot, and bring to a boil, reduce heat and simmer for 20 minutes to ensure the cauliflower are very tender. Remove the pot from the heat and puree the soup with an immersion blender until smooth. This may take about 3-5 minutes. Place the pot back on the burner, add the dried minced onions, freeze dried shallots, garlic powder, onion powder, thyme, rosemary, paprika, black pepper and thinly slivered carrots. Bring to a boil, then immediately reduce heat to a simmer. Simmer for 5 minutes. Add the unsweetened almond milk and nutritional yeast. Stir well. Add the 4 cans of white beans (or cooked beans from dry) and stir. Cook for 13 minutes. Taste the seasonings. Add more if needed. Serve: Top individual servings with snipped chives. *Freeze dried shallots: We LOVE freeze dried shallots, they are so good and always add a nice element to a lot of Vegan WFPB recipes. They can be found reasonably priced on Amazon if your local grocery store does not carry them. 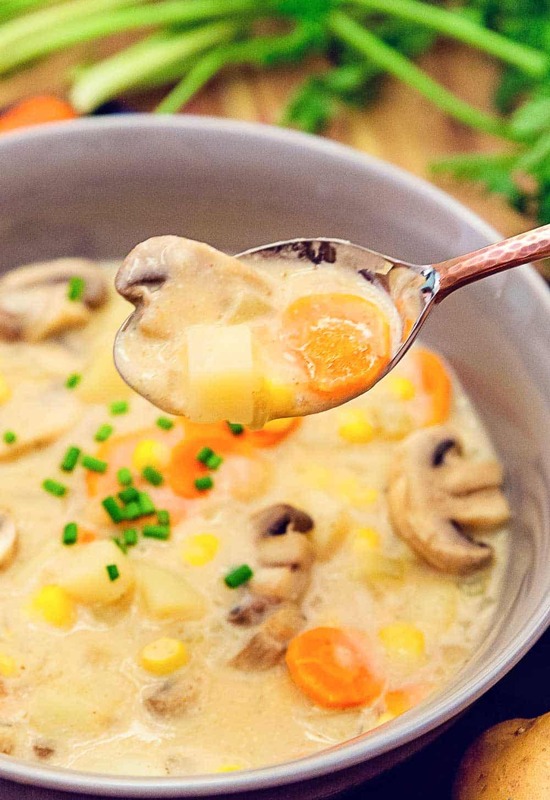 *Vegetable Broth: We used Pacific Organic Vegetable Broth because it does not have MSG, and has no highly processed ingredients; however, Pacific has a very strong flavor so our water to broth ratio is heavy on the water and low on the vegetable broth. If you are using a vegetable broth other than Pacific, please adjust the water to broth ratio accordingly. Storage: Cool to room temperature. Store in glass or plastic container. Freezes well.